Evidence of human history in the Mojave region extends back to when perennial lakes existed in the region at the close of the Pleistocene, nearly 10,000 years ago, or possibly earlier. Although the Mojave Desert has a rich archeological record, the numbers of humans were probably minimal compared with modern populations. Evidence of early human inhabitation has been found along the shorelines of pluvial lakes. The people had to adapt to the changing climate along with the fauna and flora. It is likely that both early Holocene climate change and human predation were responsible for the disappearance of large mammal populations from the western United States (including the dire wolf, giant short-faced bear, saber-toothed cat, and California lion). Of 67 genera of North American mammals known to have become extinct during the Pleistocene, about 35 vanished between 13,000 and 8,000 years before present; in addition 10 genera of California birds vanished in the same period (Moratto, 1984). Compared with modern populations, small numbers of Native Americans utilized the Mojave region at the time of European contact in the 1600's. The tribes along the Colorado River corridor of the eastern Mojave included the Mojave, Halchidmoma, and Kohuana (or Chemehuevi or Southern Paiute); in the more western part of the Mojave National Preserve region were Chemehuevi (or Southern Paiute) and Desert Cahuilla tribes (Heizer and Whipple, 1971). The Mojave was the largest tribe and was found distributed throughout the region from the Colorado River to the San Bernardino Mountains. Most of the Mojave's Native American population vanished from imported diseases, subjugation, and hostilities prior to the 1860's. Earliest European migration into the Mojave region began with the Spanish, mostly along the western side of the Mojave Desert in the early 1700's, and steadily increased to a massive migration during the 1849 Gold Rush era. Two early travel routes crossed portions of the Mojave National Preserve: the Old Spanish Trail and the Mojave Road (which shared some of the same route). Both routes probably utilized older Indian trails that interconnected perennial water sources. Between 1598 and 1821 as Spanish exploration, migration, and trade routes converged on the Mojave region from population centers in New Mexico, Sonora, and southern California. By 1830, a system of interconnecting trails became know as the Old Spanish Trail. The Old Spanish Trial begins north out of Santa Fe, New Mexico and crosses the West north of the Colorado River along various routes with a terminal destination of Los Angeles, California. Traces of the Old Spanish Trail (and an alternative route) come into the Mojave National Preserve area from the north and east and merge to the west. Various routes may have converged at perrenial water sources at the springs along the shore of Soda Lake (near Zzyzx), but the two main routes historically intersected along the Mojave River near Yermo, west of Afton Canyon. The northern route came south from the Pahrump Valley, through Tecopa, and south through historic Valjean in the Silver Lake valley into what is now the Baker area (along Highway 127). The alternative southern route came in from the east via the Colorado River and crossed through the Preserve, basically following what later became the Government Road. Petroglyph inscriptions of early travelers are preserved at Piute Springs (in the Preserve) and include notable historic names: Garc�s, Smith, Whipple, and Beale. Beale directed a government land survey in 1853. One historic inscription reads "Stuart, 4th Inft. May 16, 1851" [though the last digit may be another number]. Another notable expedition along the trail included Kit Carson and Lieutenant George D. Brewerton in 1848. (NPS, 1998 and NPS, 2001). During the Mexican War, 1846-1848, the Americans' Army of the West conquered New Mexico, then blazed new, southern variants of the route to California, hastening the end of the Old Spanish Trail. The Old Spanish Trail was utilized during the California Gold Rush of 1849, and then by traffic between Mormon settlements and commerce between Salt Lake City and Los Angeles. Traffic diminished along the Old Spanish Trail as alternative routes developed. Two key factor leading to its decline included the abandonment of a Mormon settlement in San Bernardino in 1857 and completion of the Transcontinental Railroad in 1869. The Mojave Road (or Old Government Road) began in the east at Fort Mojave (now long gone) on the banks of the Colorado River and extended west to historic Camp Cady (about 20 miles east of Barstow). Along the route travelers typically camped near several perenial water sources including Fort Piute, Hole-In-The-Wall, and Marl Spring, and springs along Soda Lake shore (near Zzyzx). During the period of 1860-1880 the road primarily served travelers heading west to the growing coastal cities. Map showing the trace of the historic "Mojave Road" with the location of water sources along the route. Fort Piute was a small desert post located near Piute Springs in the foothills of the Piute Mountain range, about 25 miles west of Fort Mojave. Modern human impacts in the Mojave National Preserve region began with small mining and ranching operations in the 1880s. The Arrowhead gold mining district was established in 1882 with the location of the Hidden Hill mine in the southwest end of the Providence Mountains; large-scale gold mining took place with the Big Horn mine from 1918 until the Great Depression of the 1930's (Clark, 1930). Many claims and patented mines became established in the region in this era of "boom and bust" but most mines were not profitable but for a short time. Minerals mined throughout the Mojave National Preserve region included ores of gold, silver, lead, copper, iron, molybdenum, lead, tungsten, and zinc. The town of Baker began as a watering stop for the Borax mule trains bound from Death Valley. Larger scale impacts didn't begin until railroad lines were laid to service mines in the region. 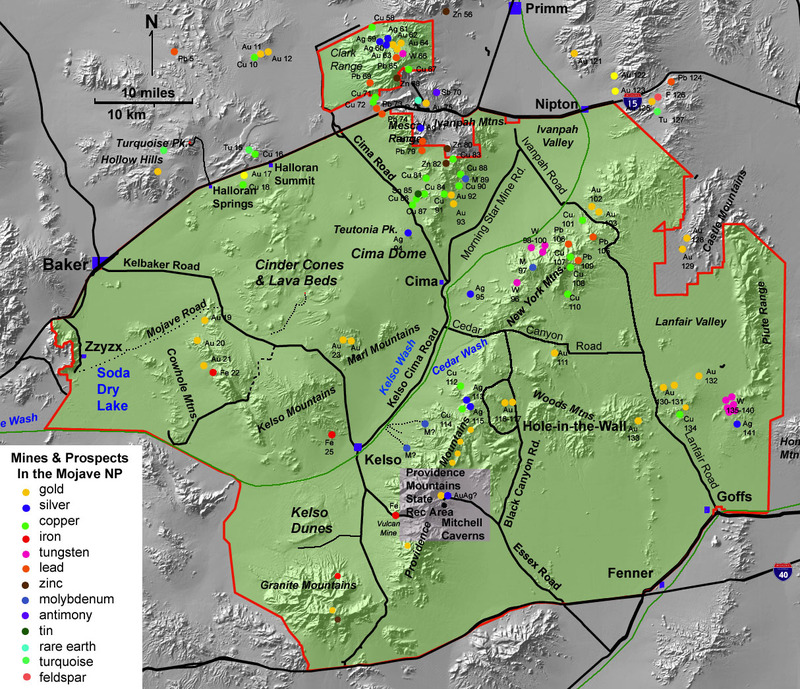 Map showing the location of selected historic mines and mining prospects in the Mojave National Preserve area. For detailed mineral resource summary for the Mojave National Preserve see Theodore and others, (2003). Numbered mines and prospects sites on this map are described by Hewett (1956). Mineral resources in the Providence Mountains are described by Miller and others (1985) and Goldfarb and others (1988). Mine and information around the south and west side of the preserve are not included on this map. For a larger version of this map, click here. Railroad lines include the current rail that passes Kelso Depot. Historic spur routes included a route to Goffs via Ivanpah and Lanfair Valley, a spur to Searchlight, and a route connection Ludlow to Death Valley (via Soda and Silver Lake valleys). By the mid 1920's automobiles became the primary mode of transportation across the region. The first rail lines through the Mojave Desert were completed in 1906; the Kelso Depot was built in 1924 by the Union Pacific Railroad to serve as a transfer point and water station. In the 1940s nearly 2,000 people lived in the Kelso vicinity, most were employees or families associated with nearby mining operations. With mine closures after WWII, and as diesel locomotives replaced steam engines, Kelso Depot was no longer needed to water the steam locomotives. By the 1950s, the once thriving town of Kelso nearly vanished. Kelso Depost is currently restored to serve as a National Park Service visitor center. The World War II era was perhaps the time of greatest human impact on the region; military activities, mining, and road building being the most important impacts. "General Patton's Army" used parts of Lanfair, Fenner, and Piute valleys as a training grounds and camps before shipping troops off to conduct desert warfare in Africa. The Vulcan Mine, the largest mining operation now in the preserve, supplied iron for the war effort. Road building associated with mining operations, railroads, and utilities carrying electricity, gas, and water to the greater Los Angeles region produce long-lasting traces across the landscape. After 50 years, many of the old traces of tank tracks are gradually vanishing, particularly on active washes and alluvial fan areas, but in some areas, such as flats that rarely flood, many of these traces are still clearly visible. The Vulcan Mine opened in 1942 to provide iron needed for World War II. The mine is located nine miles south of Kelso. During the war trains carried more than 2,500 tons of ore a day to the Kaiser Steel Mill in Fontana, California. Kaiser closed the Vulcan Mine shortly after the war because the ore contained too much sulfur. The "modern era" brought perhaps the greatest changes to the Mojave Region, first perhaps with negative impacts, but ultimately with the hopeful positive outcome of establishment of the Mojave National Preserve. With funds from Congress in 1926, Route 66 was designated for the Chicago-to-Los Angeles route. By 1930, the route had become one of the main east-to-west transportation corridors across the United States with automobiles and trucks supplanting railroads as the primary mode of transporting people and materials crosscountry. Route 66 crosses the Mojave region between Needles and Barstow, including the towns of Goffs and Ludlow (just south of Interstate 40 along the southern boarder of the Mojave National Preserve). The passage of the Federal Aid Highway Act of 1956 provided funds to develop of the national interstate and defense highway system, and by 1970, nearly all segments of the original Route 66 were replaced by a modern four-lane highway (I-40 in California). I-15 was built to connect the growing city of Las Vegas with the San Diego and Los Angeles metropolitan regions. This interstate replaced older highways between Barstow and the Nevada state line: US 91 and US 466. The growing population of the west brought increasing pressure on the development of the Mojave Desert. Additional utility lines (electricity, gas, and water) and their service roads were developed. Whereas the settlements within what is now the Preserve continued to dimish with the decline in mining, ranching, and railroads, the building of highways encouraged an influx of tourists with a wide mix of interests in the Mojave region. Off-highway vehicle enthusiasts discovered the Mojave Desert, and perhaps the worst period of environmental degredation of the Mojave Desert landscape began. The growing environmental conscience starting perhaps in the late 1960s lead to the establishment of the Mojave National Preserve that was created in October 1994 when Congress passed the California Desert Protection Act. Additional human impacts in the region include the ongoing extraction of water and associated lowering of groundwater tables (springs dry up), groundwater contamination (particularly from mining wastes), the introduction of invasive species and vanishing habitats, (redbrome grass is of perhaps of primary concern for habitat loss, and is a fire hazard), ongoing grazing, and the influx of air pollution from the metropolitan areas. In addition, the ongoing natural progression of climate change may produce significant impacts over the long term. Only time will show how the whole ecosystem, or parts of it, will respond to the combined effects of climate change and human interactions. Cottonwoods displaying autumn colors stand out in contrast to the evergreen Joshua tree forest in the high desert near Kessler Spring in the Mojave National Preserve.